With the Finance module of Eduka suite, you can easily invoice schools fees, trips or sport activities based on student’s profile or information provided online by parents. Online payment is available on Parents’ or company portal where they can easily track their account balance. The finance module offers full traceability, real time communication with payers and ultimately accelerate payment. .
With Finance module, all fees can be invoiced (deposit, registration, school, sport, school trips, uniforms etc) to multi payer levels based on student profile. Fully integrated with the students database and Admission module, invoices can be generated in mass or individually and dashboard shows profit in real time. Finance module shows a consolidated view or by transaction to facilitate the understanding of fees and payment. Eduka Suite offers a complete collection module by managing different type of payment. To facilitate and accelerate payment, payers can access their account details, check the balance and pay online directly from a secured website. Finance department can analyse through Ageing balance, any outstanding payment and send targeted and personalised reminders. 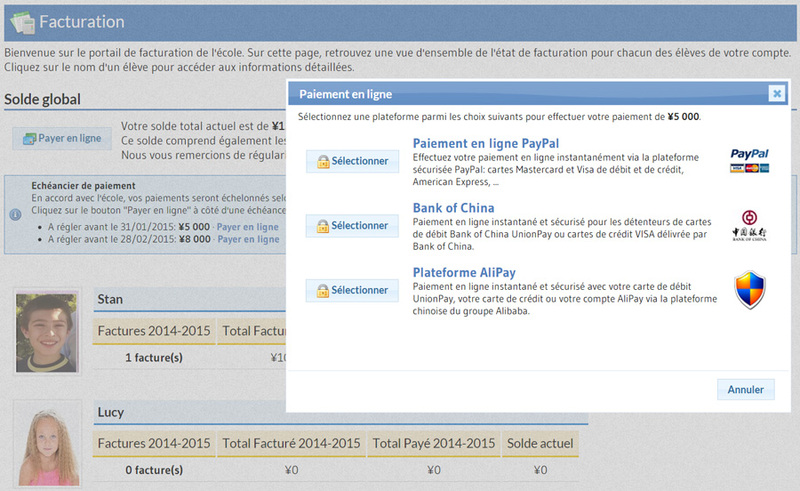 Invoices and payments are available on the payer web portal and online payment can be initiated. Thanks to reports or lists, the Accounting department can access real time finance data and perform analysis over years.